Becky Conzelman, 47, died April 6th 2019 after suffering a brain aneurysm a week prior. Conzelman was a five-time CrossFit Games athlete, a two-time National Track Champion and was the co-founder and CEO of Faith RXD. Becky is survived by her husband, two children, her parents and siblings. This is what I love about the CrossFit Community. It brings people together from all walks of life. In February of 2015 I had the opportunity to meet, Becky Conzelman, at a Faith Rx’d Camp. 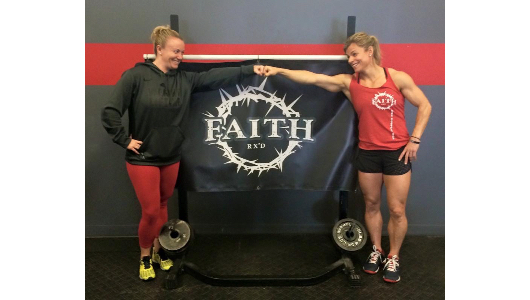 Becky was a 5 time CF Games athlete, co-founder of Faith Rx’d, a Mother of 2, and a Wife. She passed away on April 6th from complications of a brain aneurysm that happened while visiting family here in Florida. The moment I met Becky, she was bright light. She had an infectious soul, loved to compete, and most of all she loved serving God through the CrossFit Community. She actually motivated me to create a local Faith Rx’d Chapter for Sarasota. Her and her Husband, Jim, have worked out and trained multiple times at RFS. She commented that she loved the energy of our gym and the people. Becky loved EVERYONE she came into contact with. She was an incredible human being. We all know… life is precious! We will never understand things such as a life taken from us far too soon. However, she loved God fiercely and left her mark on this Earth.